"Social Status in the City presents a scientific method for measuring social status in urban settings - the Index of Urban Status (IUS). 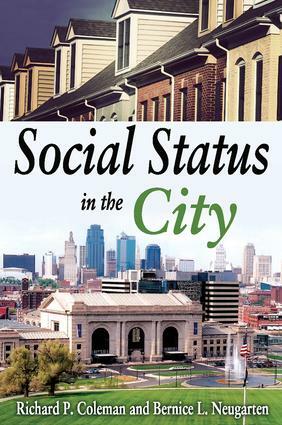 The authors show how the index and the concepts of status on which it is based were derived by describing the procedures used in studying the social structure of a particular Midwestern city. Richard P. Coleman modified the IUS when he was employed in commerce research studies of social class phenomena in American cities.A social class is a group of people who are judged by members of the community as equal to one another in social prestige. They are believed to be either superior or inferior in prestige and acceptability to other groups who constitute the social classes that are below or above them. By this definition, Yankee City, Deep South, Jonesville, Kansas City - and presumably every community in the U.S. - can all be described as having social class systems. This book is a case study aimed at larger theoretical importance.The study should be considered in the context of sociology's concerns with problems of urban stratification, the characteristics of various social class groups, and the ways these groups change over time. In this context, the book makes a contribution to social science methods as well as observation. The authors have followed in the tradition of W. Lloyd Warner and others who have attempted to understand the status structures of whole communities. This classic volume has brilliantly stood the test of time."